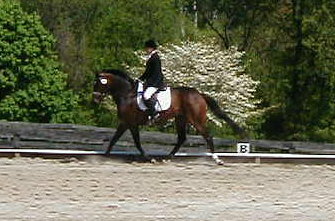 Wallstreet's Whisper is a 1998, 16.3hh dark bay Hanoverian mare by Wallstreet Kid. Whisper is a very elegant mare with lovely movement, who is easy to ride, and she has a wonderfully sweet disposition, which she passes to her foals. She was shown in dressage only three times as a four-year-old, and won four out of eight classes, with scores in the upper 60s, or 70s. She has pinned in every class entered. 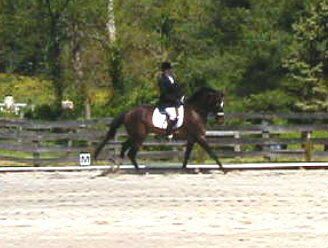 She was started over fences in early 2004, before being re-bred, and showed beautiful hunter form over fences. She is a full papered Hanoverian, approved for breeding in the main stud book by the AHS. She is also approved for breeding in the main mare book for Oldenburg, N.A. In 2003, she had a beautiful bay filly, Domino, by our Hanoverian stallion, Dumont, who earned a premium award at her 2003 Oldenburg/ISR inspection. 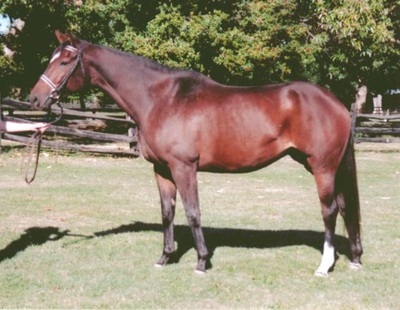 In 2005, she had beautiful bay colt, Diez, by our stallion, Dumont. In 2006 she had a stunning dark bay Eskardo filly with very impressive movement and beautiful conformation. In 2007, she has had a very impressive black colt by our stallion, Eskardo. Whisper is a wonderful mother and easy to get in foal. Due to an injury in the pasture, Whisper is not competition sound and is being sold as a broodmare. Wallstreet's Whisper is offered for sale for $5,000.00.